Green Glass Doll Eyes. Hand painted glass doll eyes with a multicolour iris. Traditionally made eye with a bulging iris for an element of realism. Speckled Green/Brown Caimen Crocodile Eyes. Concave/convex reptile/dinosaur eye with a highly detailed colouration. Green Frog Eyes with an oval pupil. Eyes designed for amphibians. Green Mammal Eyes. A multicoloured eye with a round pupil in a concave/convex shape and an accurately painted iris. Dark Brown Doll Eyes. 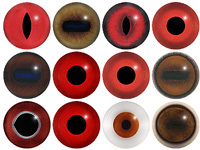 Very lifelike doll eyes for collectors dolls and toys. Set on wire for coiling into loops for stitching. Dark Blue Doll Eyes. 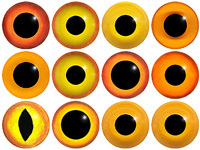 Very lifelike doll eyes for collectors dolls and toys. Set on wire for coiling into loops for stitching. Green/Grey Human Mannequin or Doll eye. Ideal for wax or clay sculpture work. Handpainted with a slight corneal bulge for added realism. Great for special effects projects. Green/Gold Pike Fish Eyes. Great eyes for most species of fresh and saltwater fish. Made from German crystal and hand painted in enamel. Brown Glass Doll Eyes. Hand painted glass doll eyes with a multicolour iris. Traditionally made eye with a bulging iris for an element of realism. Grey Glass Doll Eyes. Hand painted glass doll eyes with a multicolour iris. Traditionally made eye with a bulging iris for an element of realism. Speckled Green Crocodile Eyes. Concave/convex reptile/dinosaur eye with a highly detailed colouration. Shimmering Green Crocodile Eyes. Concave/convex reptile/dinosaur eye with a highly detailed colouration. Green Cat Eye. A premium grade Fox/Cat eye with a slit pupil. An excelllent exhibition quality eye. Green Teddy Bear Eyes. An 'old fashioned' style eye where the glass is coloured and the eye is not painted on the back. Single loop fixing. Blue/Gold Glass Doll Eyes. Hand painted glass doll eyes with a multicolour iris. Traditionally made eye with a bulging iris for an element of realism. Green/Blue Doll Eyes. 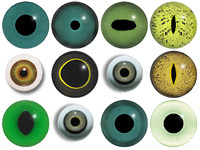 Very lifelike doll eyes for collectors dolls and toys. Set on wire for coiling into loops for stitching. Emerald Green Cat Eye. A premium grade Fox/Cat eye with a slit pupil. An excelllent exhibition quality eye. Green/Black Glass Bird Eyes. Concave/Convex multicolour bird eyes made from crystal and hand painted. Blue Glass Doll Eyes. Hand painted glass doll eyes with a multicolour iris. Traditionally made eye with a bulging iris for an element of realism. Pack of 3 Green Teddy Bear Eyes. An 'old fashioned' style eye where the glass is coloured and the eye is not painted on the back. Single loop fixing. Dark Green Glass Bird Eyes. A single colour iris with a black pupil on wire. Ideal for stickmaking and Decoy carving.